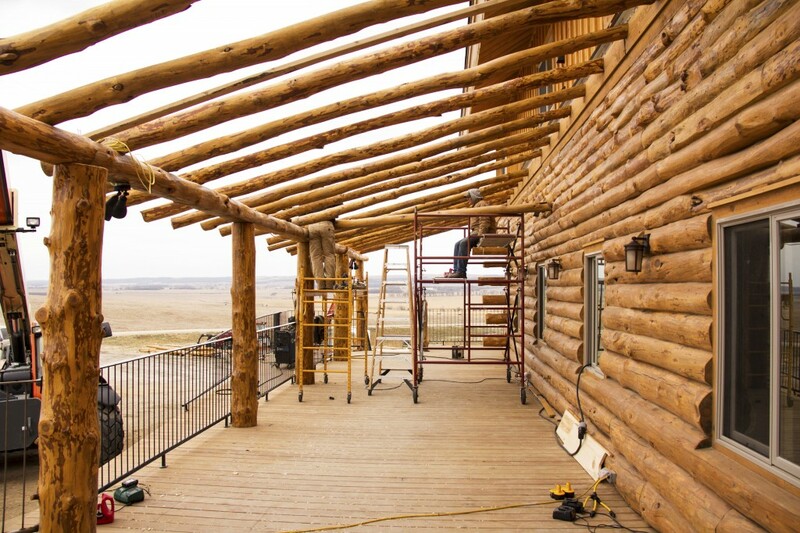 More progress was made in October at the lodge than probably any month before. Why? Well, maybe because we had a wedding there on October 20th! Stay tuned to see some pics from the wedding. 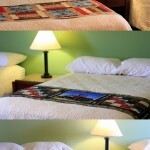 Until then, enjoy some photos of construction and newly completed rooms and spaces. The east porch at dusk. 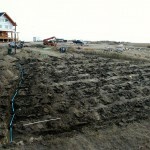 It will be a splendid place to enjoy a prairie sunrise. And it is large enough for entertaining a decent size gathering. 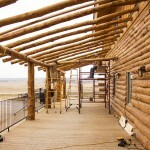 We love the loggy porch roof. 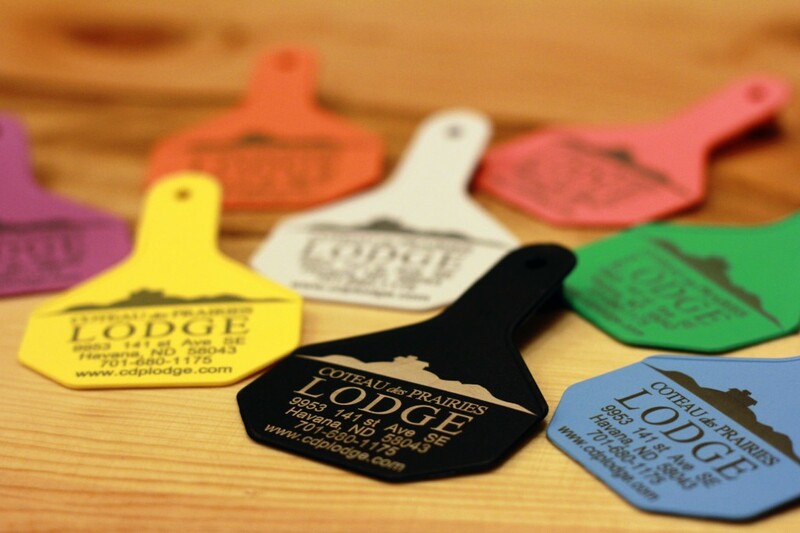 This is the full set of Coteau des Prairies Lodge Y-Tex cattle ear tags. Yup, you read that right. Why did we customize cattle ear tags? It sounded like too much fun to pass up! 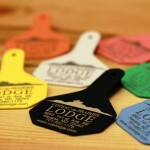 We are using them on lodge room key rings for guests and we'll probably come up with other fun uses. They are also available for sale as souvenirs. 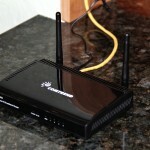 Our WiFi is up and running! 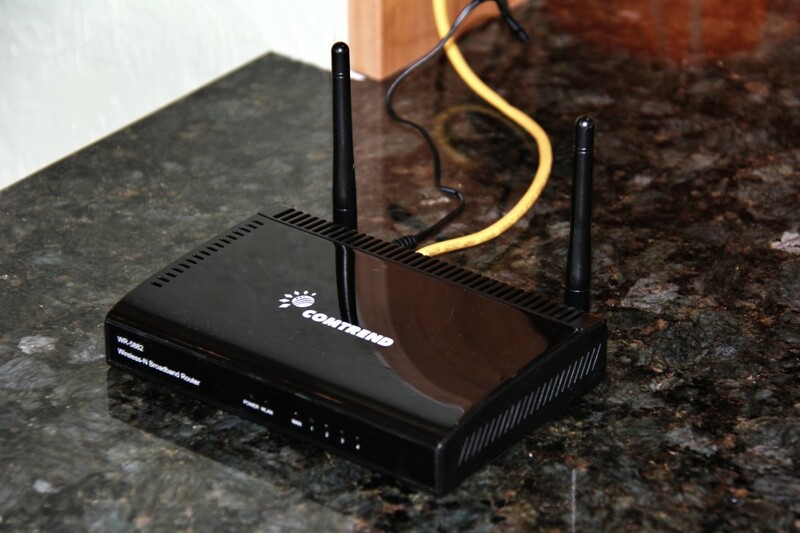 We offer free WiFi for our guests. Yeah, there aren't a lot of pastures out there featuring free WiFi. It may be a first. We'll look into that. Here is our great room dining table. 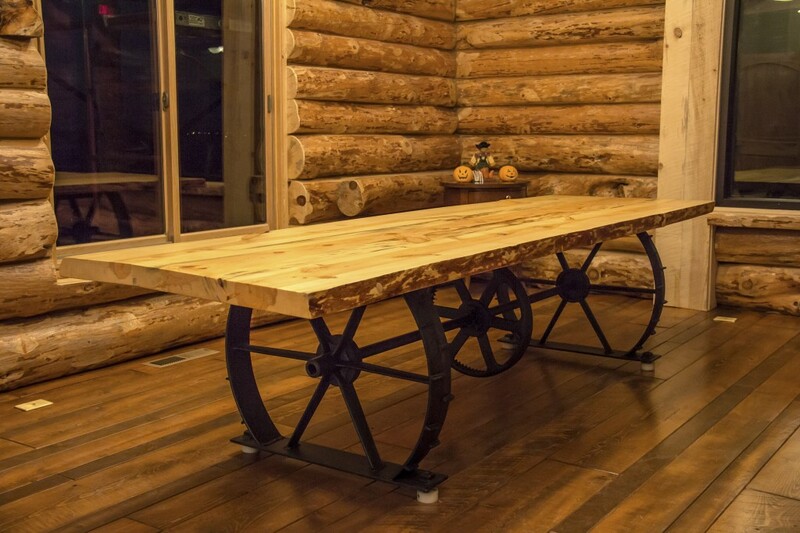 We made this table from thick slabs of North Dakota ponderosa pine, cut out of the same logs used in the walls. The base is made out of cast iron wheels and gears from an antique mower. The large 10' x 3' table easily seats 12 or more. 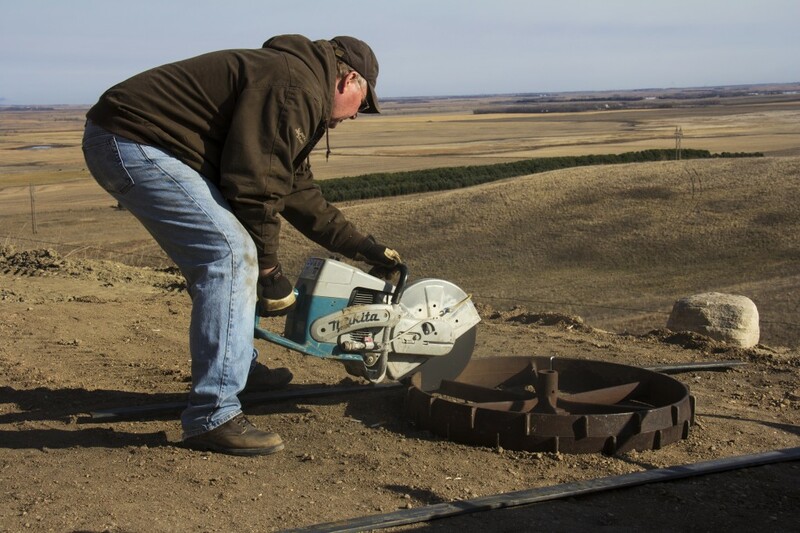 Joe Breker is cutting an antique cast iron mower wheel. 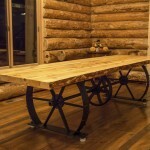 We used a set of these cool wheels to make a base for our great room dining table. There is so much to like about the great room. Tell us, what is your favorite part? 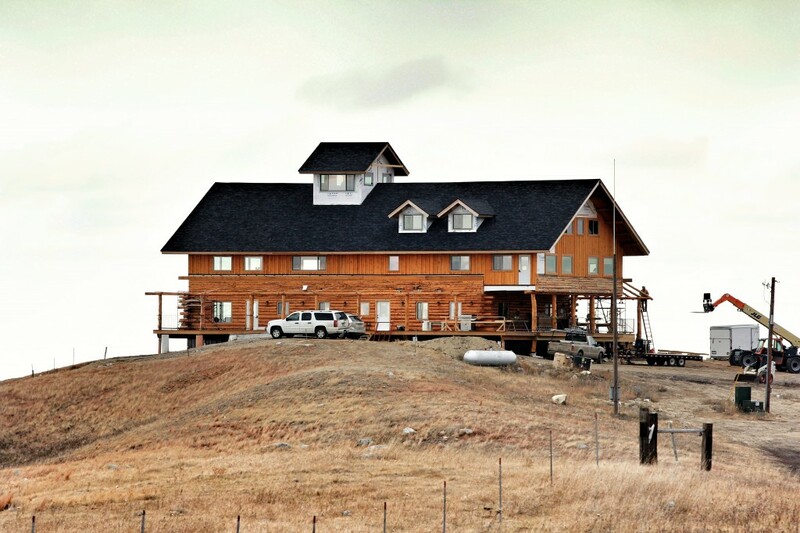 The wrap around 2nd floor balcony? 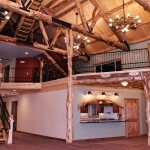 The loft balcony? 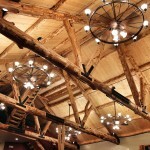 The tall ceiling with exposed log roof trusses? 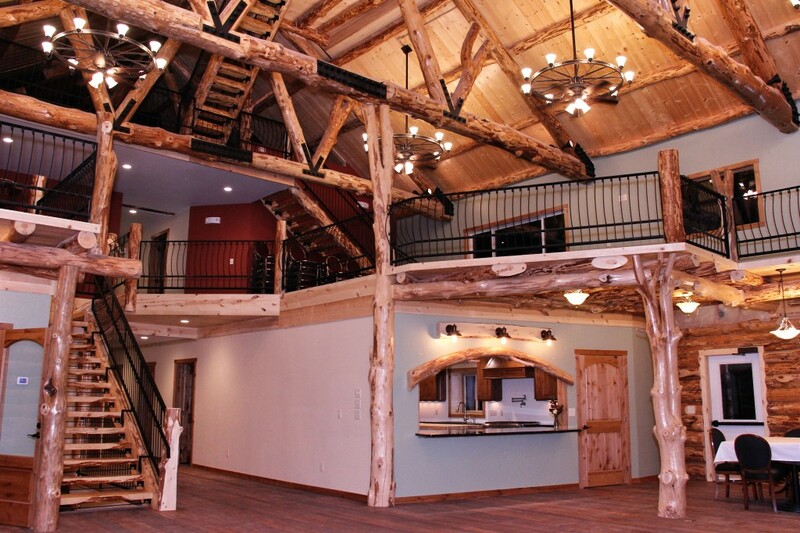 The rustic open staircases? The homemade pine floor? The unique chandeliers and railings? Pictures just don't do justice to the great room and its magnificent roof structure. We have heard that comment time and again form our visitors. They enjoy seeing the pictures on the web, but in person they were astonished. 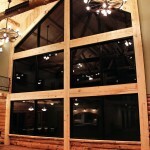 The north window in the great room is trimmed out and looking snazzy! 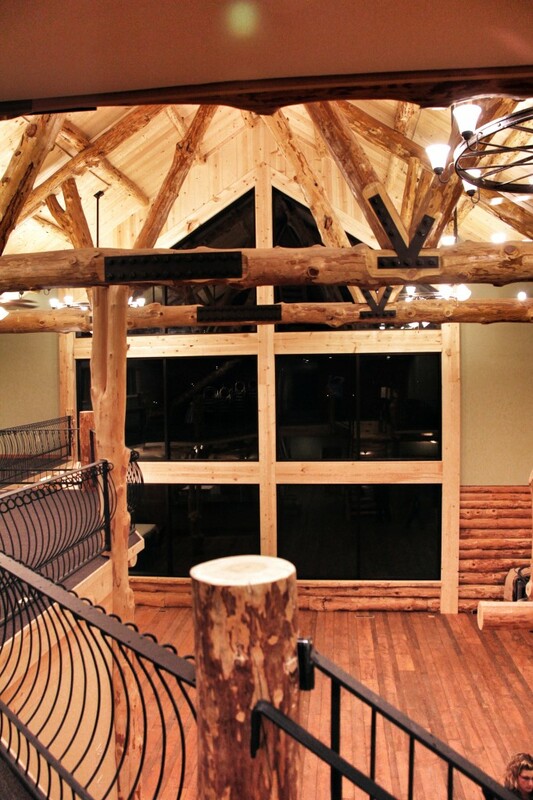 We used rough sawn ponderosa pine from the Black Hills to trim the north window. 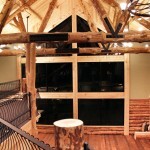 Someday we may face the window with logs, but for now the pine actually looks really nice. View of the great room from the top of the main stairway leading to the balcony. 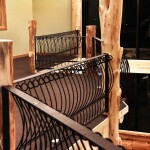 The railing wraps our balconies and stairways, that is a couple hundred feet of railing (not counting the deck railing). 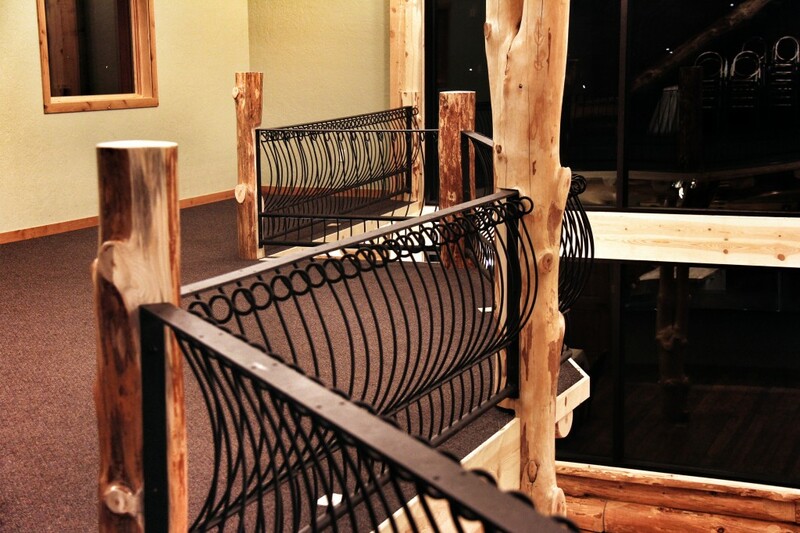 This railing is made from the tines of antique horse drawn dump rakes which Doug Spieker has salvaged over the last year or so from local farmstead shelter belts. It took at least a dozen rakes to make our balcony railings. Fall at the lodge is beautiful. 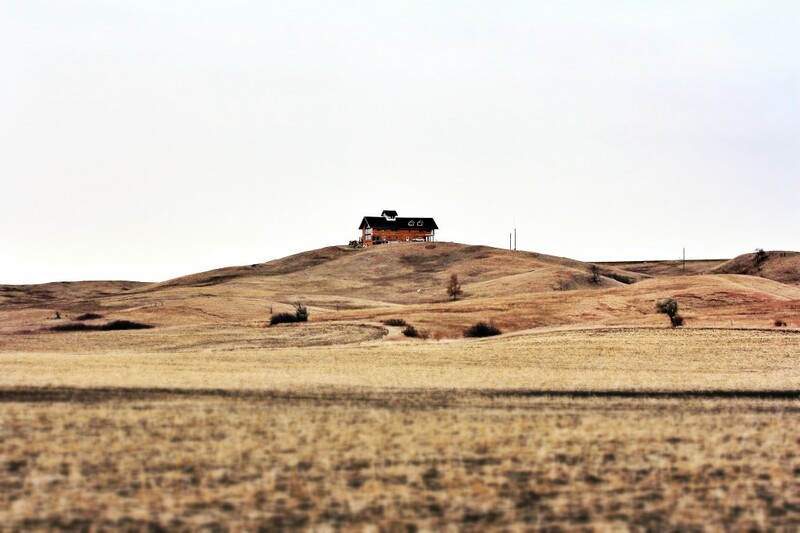 The browns, oranges and reds of the pasture along with the golden stubble in the fields go well with the rich earthy colors of the lodge. 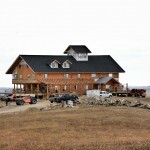 The lodge is getting so close to being all done on the outside. October is the month most of the siding finally went on. We are very please with how it looks. 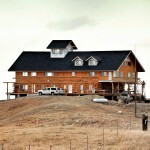 The vertical lines of the siding seem to balance the horizontal logs well. The siding is going on and the porch roof is going up. Soon it will be all done! 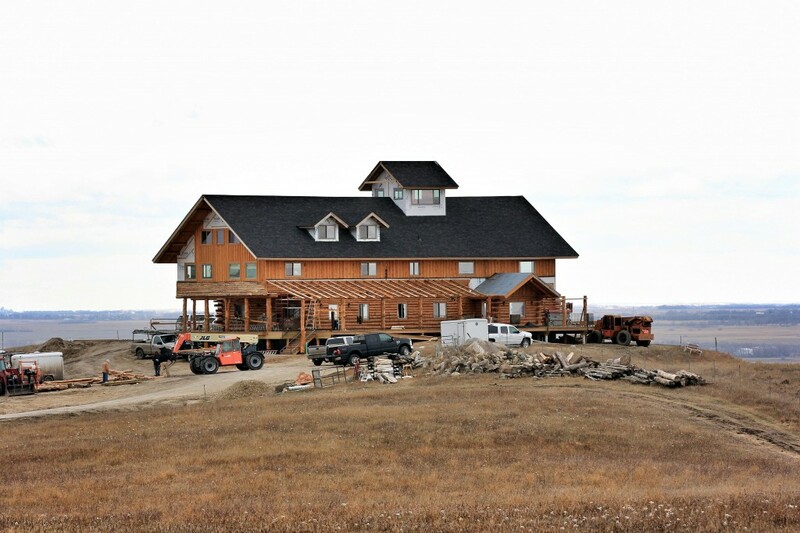 We can't wait to see the lodge when it is all done. 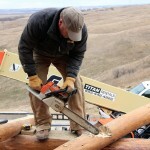 Nate Rude, the log master, is 'scribing' log porch roof rafters where they attach to the header log. 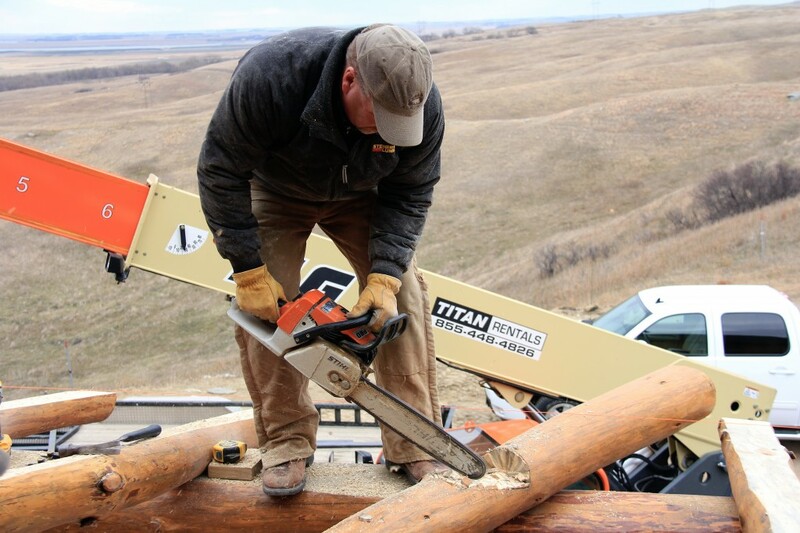 It takes a unique cut for each log to match up just right with the header and to provide an even surface for attaching the roof. 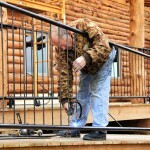 This is the guy who has been in charge of railings. 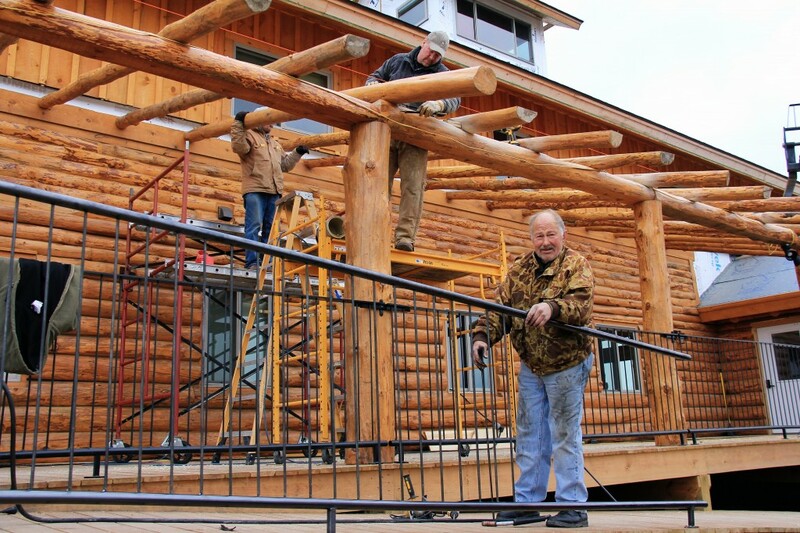 Doug Spieker and his team handmade ALL the railings at the lodge. 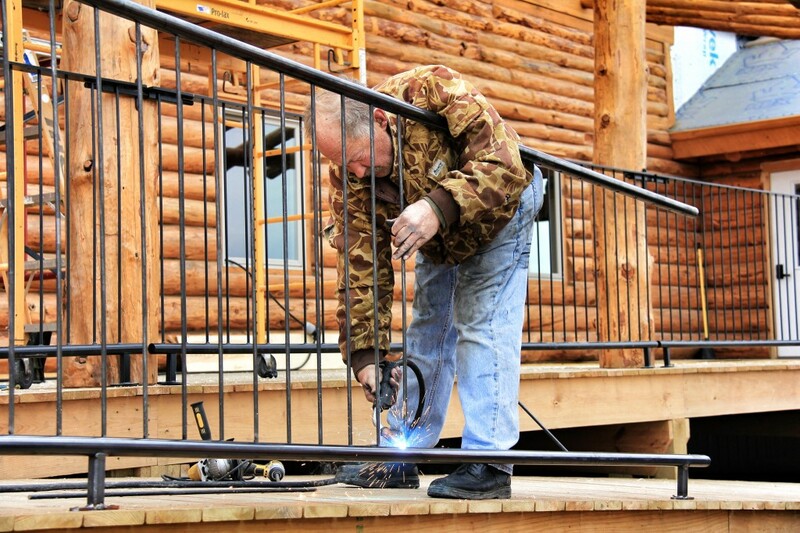 Here he is welding the railing on the handicap ramp outside the main entrance. The porch crew is taking advantage of a lovely fall day to get some work done outside. 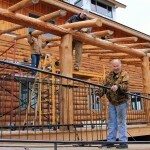 Jerry and Nate are the log rafter gurus and Doug, well Doug is just an all around stud. He's our blacksmith. 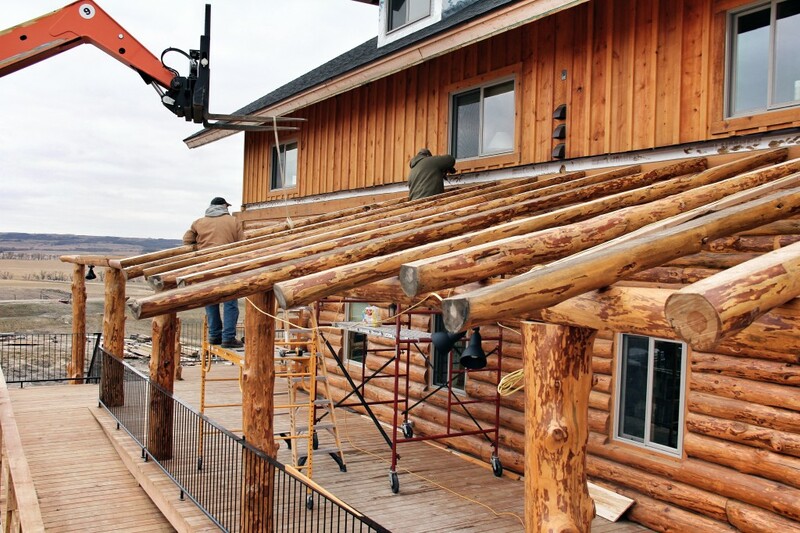 Nate Rude and Jerry Sapa work their way across the face of the lodge, adding log porch roof rafters approximately every 3 feet. 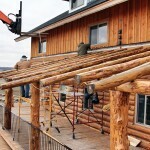 It takes a lot of logs to make 80 feet of porch roof (plus 80 on the other side). 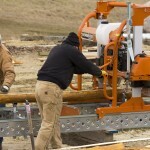 Nate is 'scribing' the logs together. 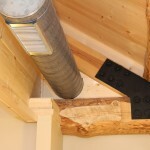 Basically, that means he makes a special notch in each log so it matches with the header log and provides an even surface above for the boards of the roof to be attached. 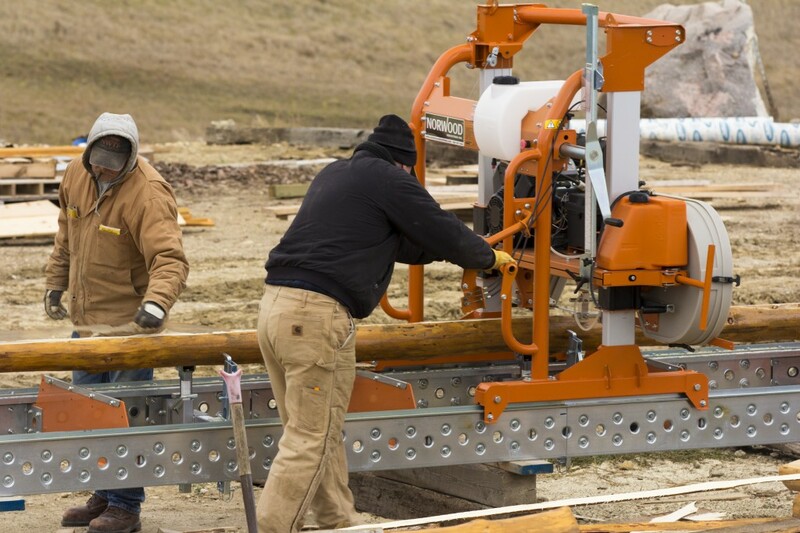 Jerry Sapa and Nate Rude work together on the Lumber Saw to make flats on the porch roof rafter logs. It seems like Nate is always looking for an excuse to use his new saw. 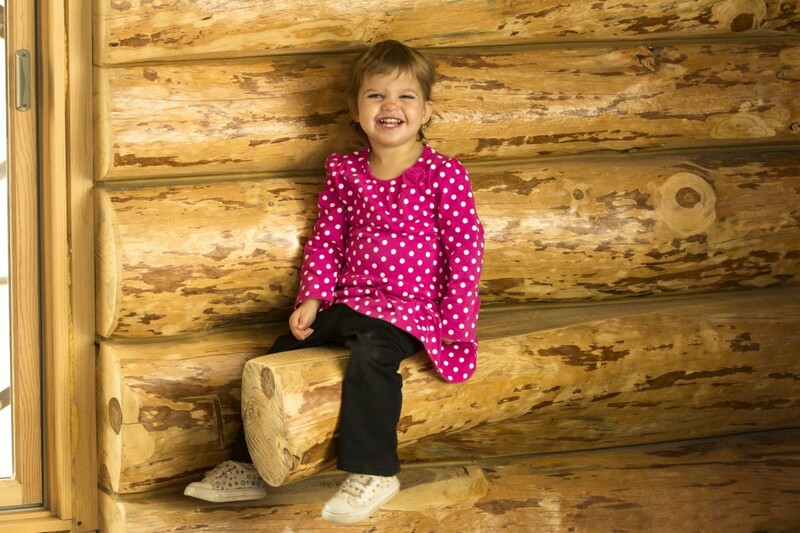 Hadassah Breker found a great perching spot on the wall in the great room. Who says you can't build seats right into your wall? 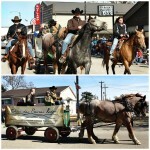 Uffda Day Parade! 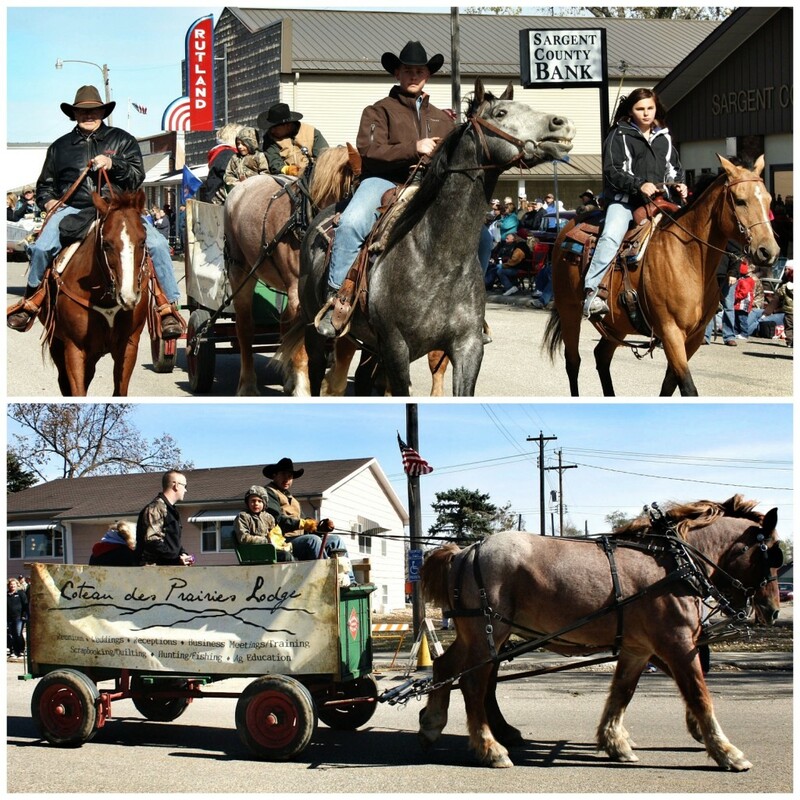 Did you see the Coteau des Prairies Lodge wagon? It was a little chilly outside, but everyone had fun and got their fill of terrific Scandinavian goodies on Sunday in Rutland. 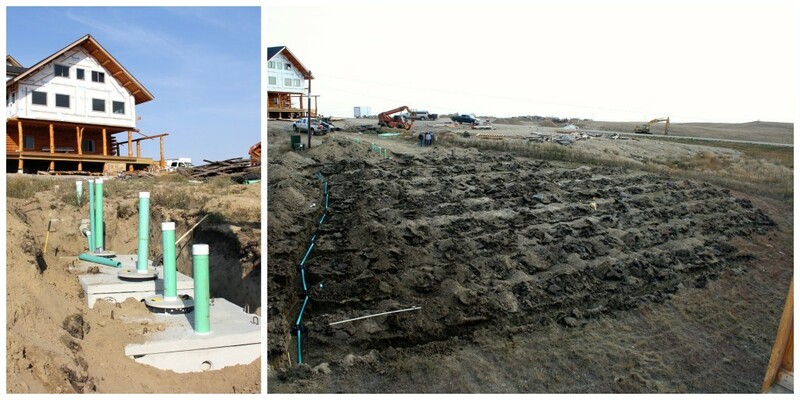 OK, so maybe there are more exciting things to share than this, but we just want to show how big of a project it is to put in a septic system for a place the size of the lodge. 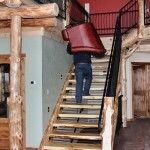 Joe Breker may not be a furniture mover by trade, but he sure got in his share of furniture moving in October. A lot of folks did out at the lodge. 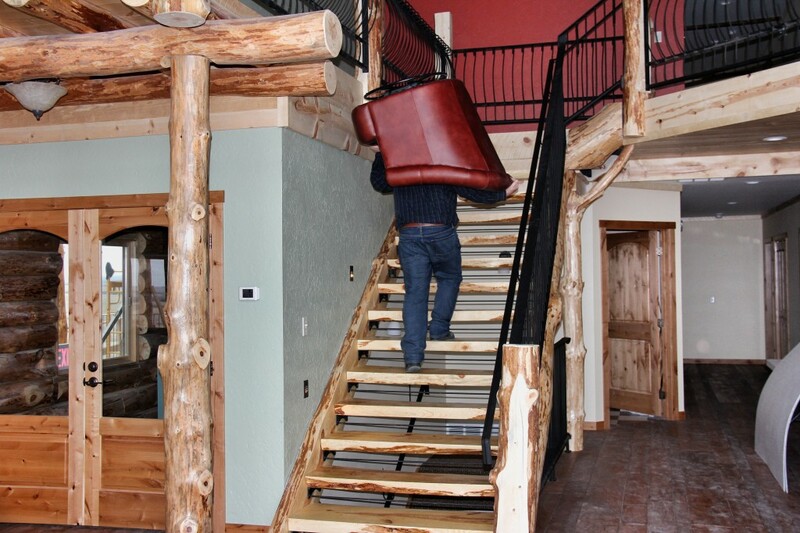 It takes a lot of furniture to fill a 10,000+ sq. 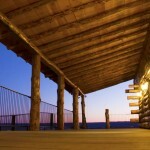 ft. lodge. 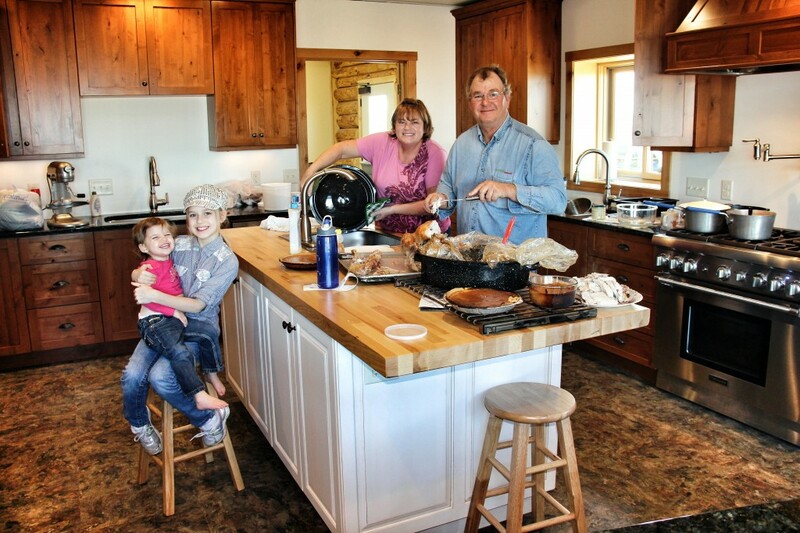 Joe and Patty Breker prepare a turkey dinner in the kitchen as their grand daughters Emma and Hadassah provide entertainment. 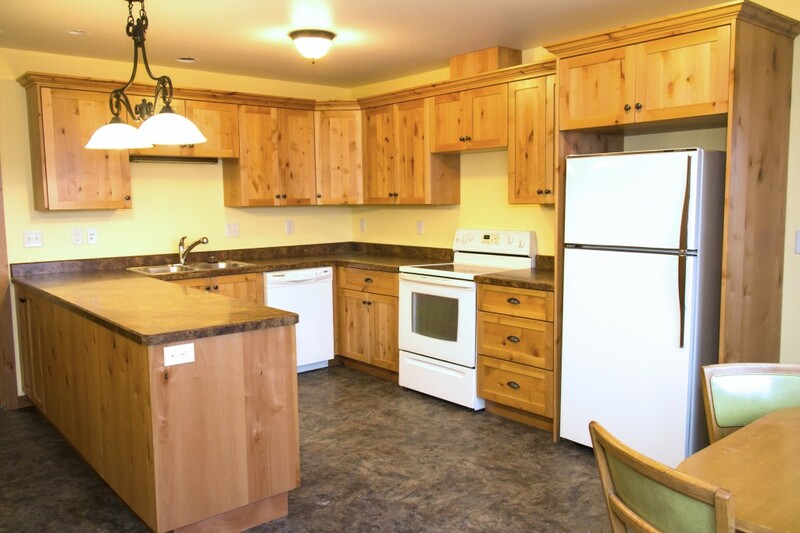 The main kitchen is spacious, functional and very homey as you can see. 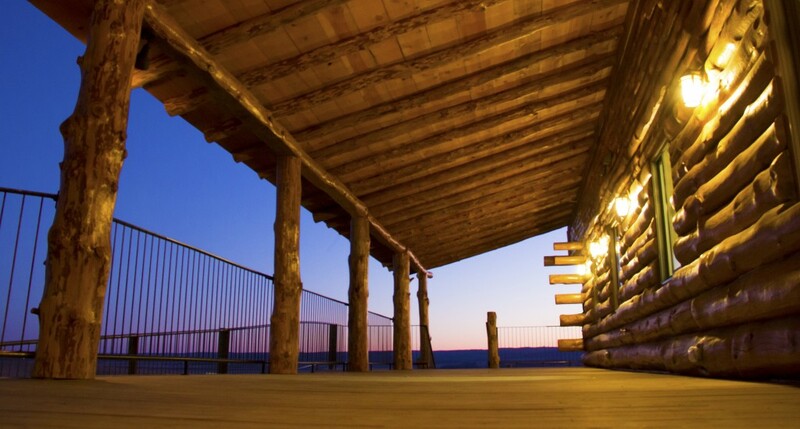 With 15 toilets in the lodge, keeping them clean is no small feat. Good thing Olivia Stenvold is in charge, she will roll up her sleeves and get right in there. But you better not laugh, or you will find yourself with a toilet brush in your hand. 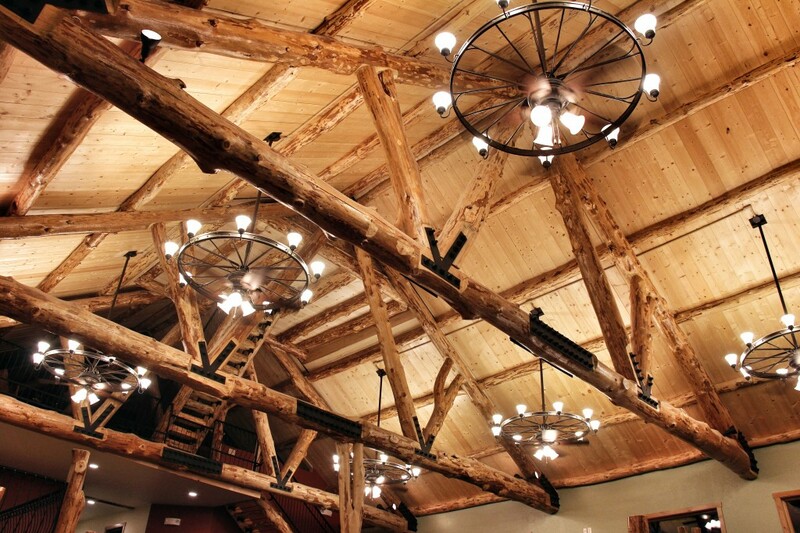 The lodge wouldn't be complete without this very special addition. 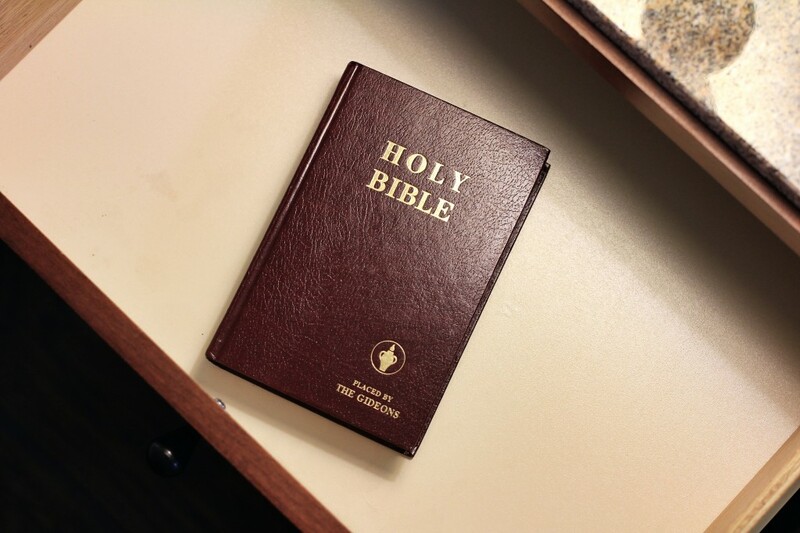 Thanks to the Gideons, our guests will never lack for fine literature in their rooms. 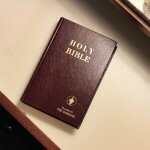 We pray God's Word will find its way into the hearts of all who venture to read. 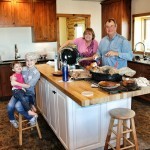 Olivia Stenvold, our maid extraordinaire, is developing a new set of skills as the lodge manager. Actually, she is learning lots of new sets of skills as the lodge manager. Builder, Maid, Concierge, Event Coordinator, Chef, Tour Guide, etc. 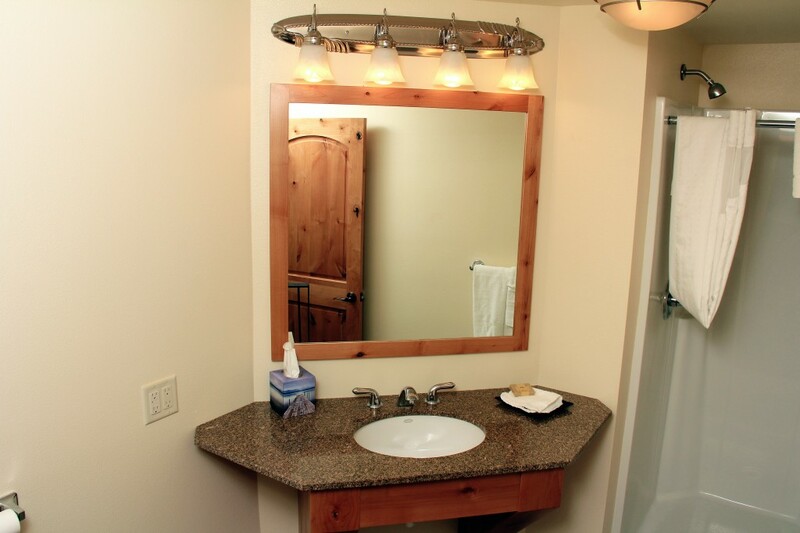 Each of our bedrooms features a private bathroom. 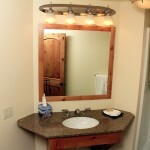 They all have a nice big mirror and a granite top vanity. This bathroom is found in the Goose Room. Honk! Honk! This is really cool, but it's kinda hard to explain what it is. 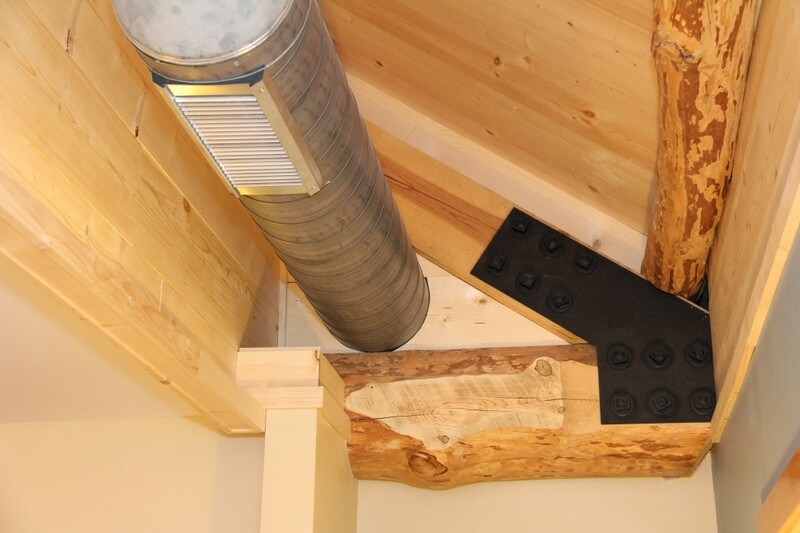 It is like a cove in the ceiling of our second floor rooms which exposes the roof, log trusses and air ducts. We just couldn't bear the thought of closing in these great spaces. The suite also features a living room. This room has other uses as well. It may be used as a bedroom. The sofa is actually a hideaway bed. We have plans to one day to build a stone fireplace in the corner. The suite features its own private kitchen with walk out patio. 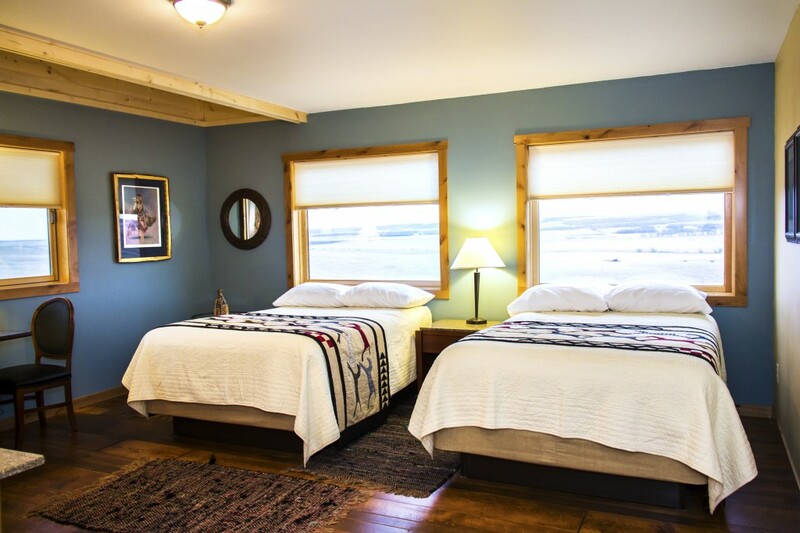 The lodge is designed so that a group can rent the suite and have privacy even while other guests may be staying at the lodge. This is the bedroom of the suite. It is themed with Terry Redlin art. Redlin, one of America's most loved painters, is from the Coteau des Prairies. 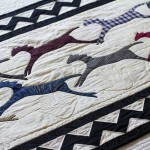 His nostalgic Americana pieces are very reminiscent of the communities in our area. The Duck Room, the Tractor Room and the Honey Bee Room are found on the second floor along with the Native American Room. 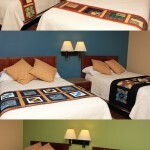 Each room includes two full size beds and a private bathroom. 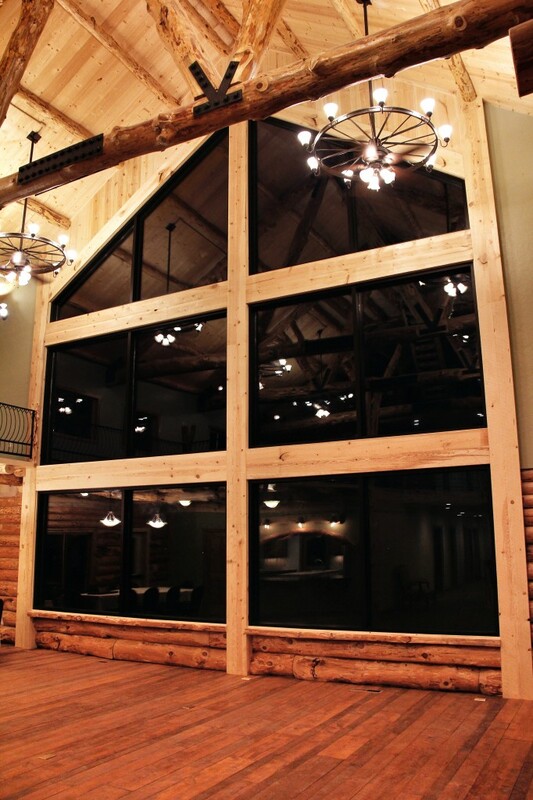 Introducing the Pheasant Room, the Goose Room and the White Tail Deer Room. 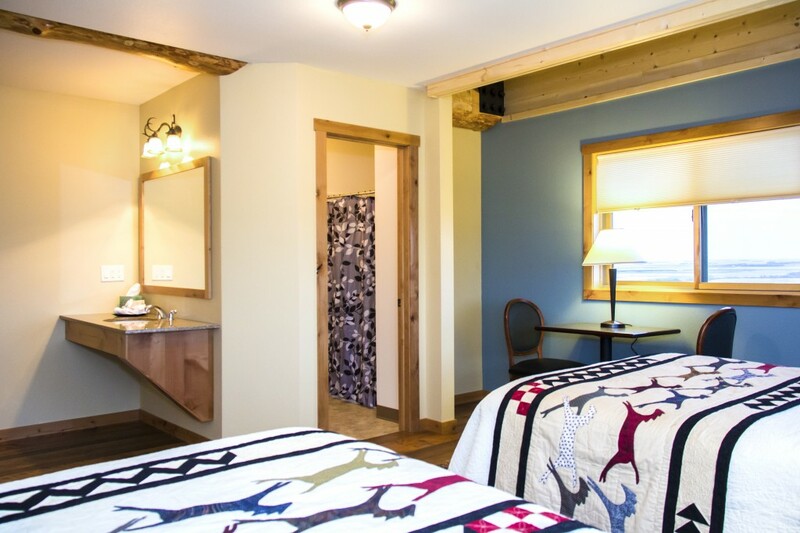 This trio of wildlife themed bedrooms are located on the south end of the lower level. As you can see, they are lively, but not yet fully decorated. 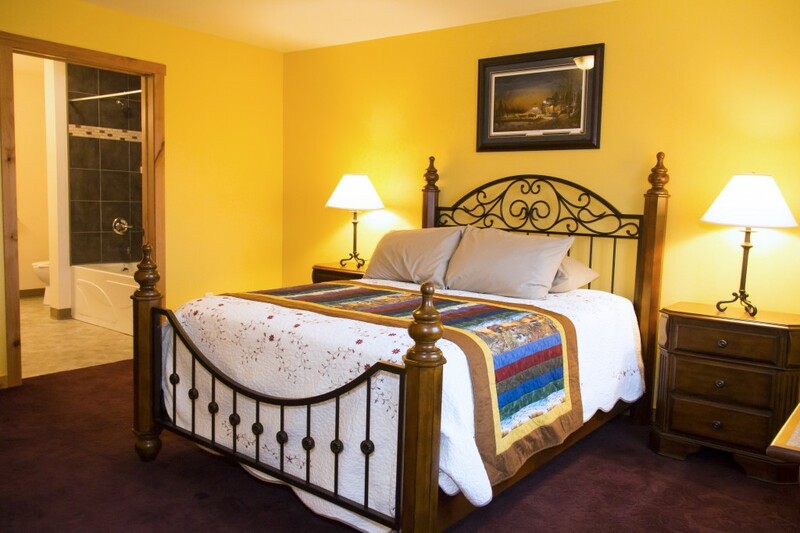 We have a pair of beautiful bedrooms on the main level. 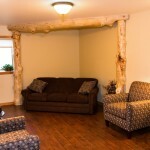 The greatest thing about these rooms is the gorgeous log walls. 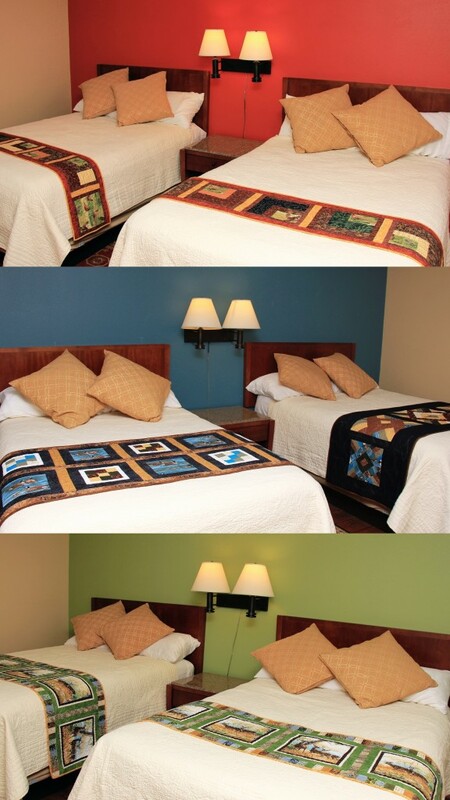 Many visitors comment that these are the rooms they want to stay in. They are both handicap 'friendly', with one being fully handicap accessible. 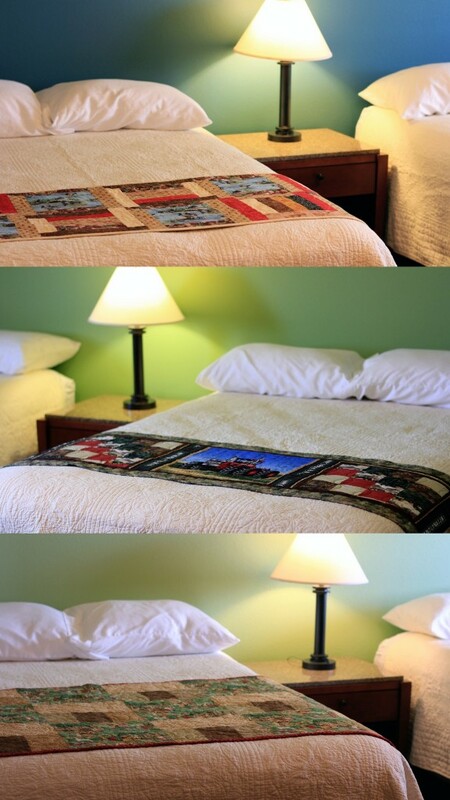 Kathy Brakke handmade a beautiful matching set of quilted bed runners for the Native American Room. 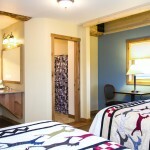 There are handmade runners on all the beds in the lodge. 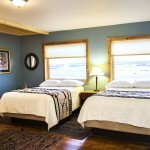 This large room features 2 full size beds and a private bathroom. 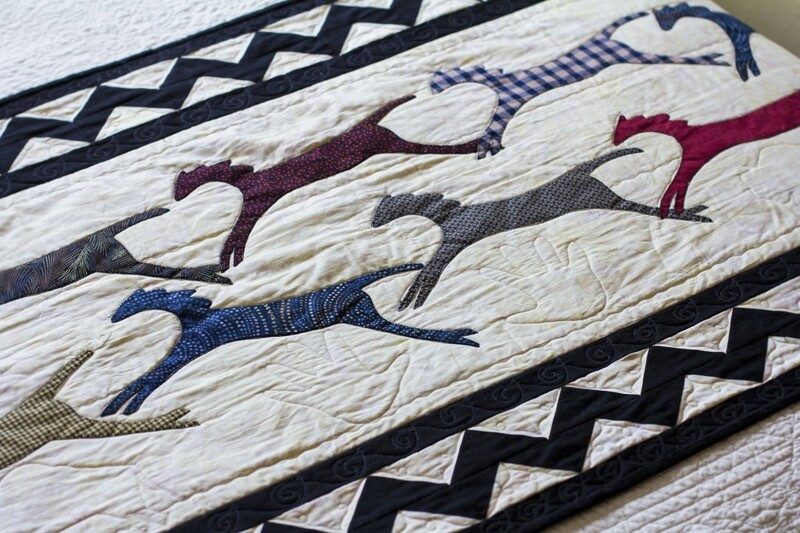 The beautiful Native American themed bed runner quilts were handmade by Kathy Brakke from Rutland. 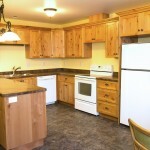 The pine flooring was handmade by Alan and Dorreen Olstad from Rutland. 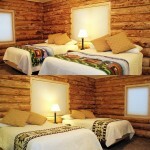 Introducing the Native American Room. 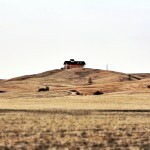 The Sisseton-Wahpeton Oyate of the Great Sioux Nation has a long history dating back hundreds of years in our area. 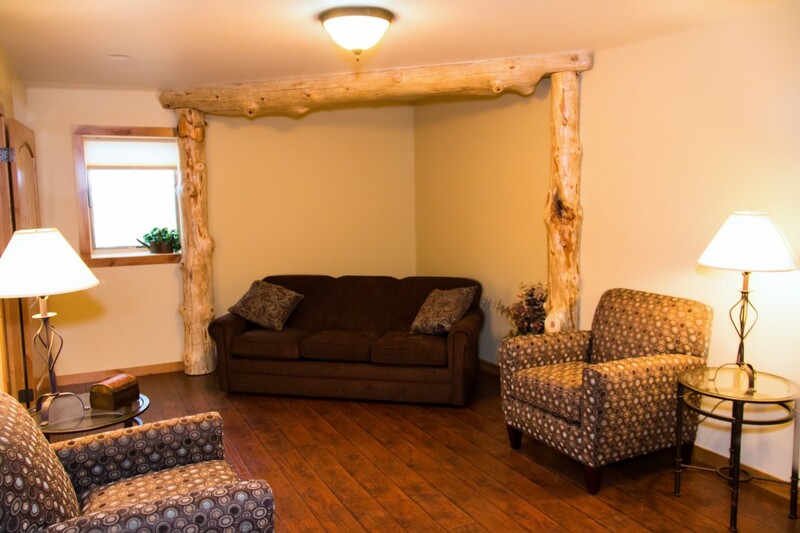 The lodge itself is located on the Lake Traverse Indian Reservation where many of the Sisseton-Wahpeton people live today. Thanks for all the posts. Maybe you’ll arrange at least a tour for those not staying with you next summer at the Kulzer Reunion in July! Inez O.